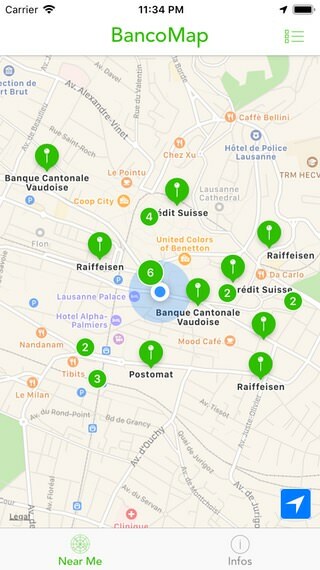 BancoMap allows you to easily locate a nearby Bancomat (ATM) or Postomat anywhere in Switzerland. Have you ever found yourself searching for an ATM? Thanks to BancoMap and its regularly updated database, you will never again be searching for an ATM. 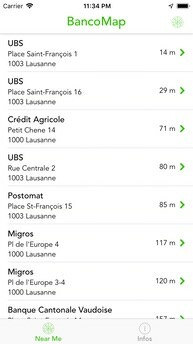 Includes more than 4.400 ATMs throughout Switzerland. 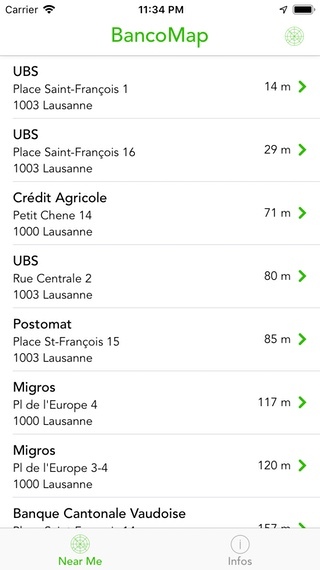 ATMs from 85 different banks, including Swiss Post. Show directions to an ATM using Apple Maps, Google Maps or Waze. ATM data is processed manually, but if you work in a bank or if you own a bank and have access to the GPS coordinates of the ATMs, contact me! A Coriolis Technologies, Stephan Burlot project. Requirements: Requires iOS 11 or later. Internet connection required to update the ATM list. App is now free. Free as in beer! New: Complete update of the ATM list. New: Postomats are also part of the database. Fixes: Duplicate ATMs have been removed. And iPhone 4, 4S, iOS 5.1 Update. Do you have a suggestion, a comment, a correction? You may send us a message using this form or the email address below.